Neofinetia falcata is an easily grown orchid. In nature it grows on trees or sometimes rocks, and is termed epiphytic in habit (literally meaning “a plant growing on the outside of something”). Therefore, they cannot tolerate being planted in soil, but instead require other composts that remain airy and do not break down quickly. They also are very resistant to cold in winter compared to most other epiphytic orchids. They do need a true cool winter rest to flower and grow correctly, but just as important is a long, warm, and moist summer season. Fuukiran, being special forms of N. falcata, respond to the same basic conditions as the typical wild form of the species. Let’s start with proper planting. 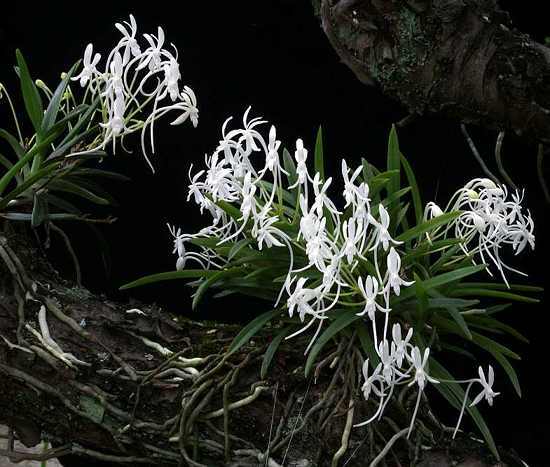 The wild forms of Neofinetia falcata, known as fuuran in Japanese, can be grown like they are in nature, that is, mounted to outside trees in appropriate climates or onto tree fern plaques, any nontoxic wood, or for that matter onto rough stone such a pumice. I grow large ones on inverted clay flower pots very successfully. They can also be grown like their tropical relatives such as Vanda and Ascocentrum, in clay pots or baskets with little compost. Some people grow them in a typical orchid bark and perlite mix with reasonable success. As long as the growing medium isn’t allowed to break down too much or stay continually wet, thus insuring healthy roots, they will grow fine using any of these methods. These wild forms of N. falcata are naturalized on a plum tree in the author's garden in Fukuoka, Japan. If you do decide to mount your fuukiran onto wood or tree fern, I recommend putting down a thin layer of sphagnum moss over the area of attachment to give the roots a water source between wettings. Neofinetia roots do not like to remain wet continuously, especially during their dormancy, but they do like a layer of moss to grow onto. I’ve had good success attaching plants to trees in my yard this way as well. I prefer to use fine fishing line to wire them on since it is strong and difficult to see. Usually within one growing season a new plant will be firmly rooted onto its mount and it time you’ll find that individual roots can extend 40 cm (16 inches) or more. The next most important issues are temperature and watering. I’ll handle them together since they directly influence the plant’s happiness synchronously. This species comes from subtropical to warm temperate regions of Japan and Korea that get distinct seasons. In winter it is cool to even cold most of the time with temperatures ranging between -5 C to 15 C (23 F to 60 C), but these end points mark the extremes. Here in Fukuoka Prefecture a typical day in January will bottom out just above freezing, say 2 C (35 F) and rise to 8 C (46 F) by afternoon. These conditions in no way harm plants, nor are they required for an adequate dormancy, which these plants do require to grow and flower properly. My suggestion is that you drop growing temperatures to at least 10 C – 15 C (50 F – 60 F) during the winter months (December through mid March), and back off watering so that they don’t stay wet very long. If your conditions are humid (above 70%) you shouldn’t need to water more than once a week. If you grow inside a house, you may water more, but don’t overdo it. This lovely Ginsekai is being grown the traditional way - on a mound of long fibered sphagnum moss. When daylight increases and temperatures rise in April, begin watering more often. Temperatures in the 15 C – 25 C range (60 F – 77 F) are ideal at this time. You will notice that root tips will begin growing again, and new roots will initiate along the attachment points of the leaf axes. As June comes increase watering, especially if temperatures start to average above 25 C (77 C). June is the time of the monsoon in Japan, so it is OK to water the plants freely at this point. The best time to water is in early evening. I water daily once the heat kicks in. Also at this time you should start fertilizing the plants once again. Any water soluble fertilizer with micronutrients works well. Ideally they should be fed once a week while in active growth. I use a fairly weak solution, about half normal strength. By late June (earlier if you grow inside) you will begin to see the flower stalks growing. This is the happy time for a fuukiran grower! Take care when watering as the stalks develop since direct watering onto them can cause them to blast, in particular sensitive plants like Seikai and Unkai. Also watch for pests at this time. While most of the year pests don’t usually cause a problem, flower stalks with their soft new tissues are a delicacy to many bugs. I find that mealy bugs in particular love them and so you must remain vigilant. Avoid any drying at this time to insure that the flowers last as long as possible. The best you can expect is around 2 weeks for most. After flowering is over I recommend removing any seed pods that have developed. These will only burden the plants. Keep up with watering on a daily basis and routine fertilizing. As temperatures peak you may be forced to add more shading to the growing area. Neofinetia falcata are naturally forest dwellers, so direct sun is not good for them. Also, higher heat increases water loss from the leaves, so decreasing light levels at this time along with adequate watering will ensure your plants thrive even during blistering periods. August 2010 was the hottest year on record in Japan. The average temperature for Fukuoka City was 30.3 C (86.5 F) with highs up to 34 C – 36 C (93 F – 97 F) daily and nights only down around 26 C – 29 C (79 F – 84 F). I was watering my plants to beat the band and they came through with flying colors. While I wouldn’t recommend such temperatures, these plants can handle it and even thrive. A good average temperature for summer is between 25 C and 28 C (77 C and 82 C), but cooler is fine too. Roots start growing in spring. These lovely ruby red root tips belong to the purple flowered form, Shutennou. 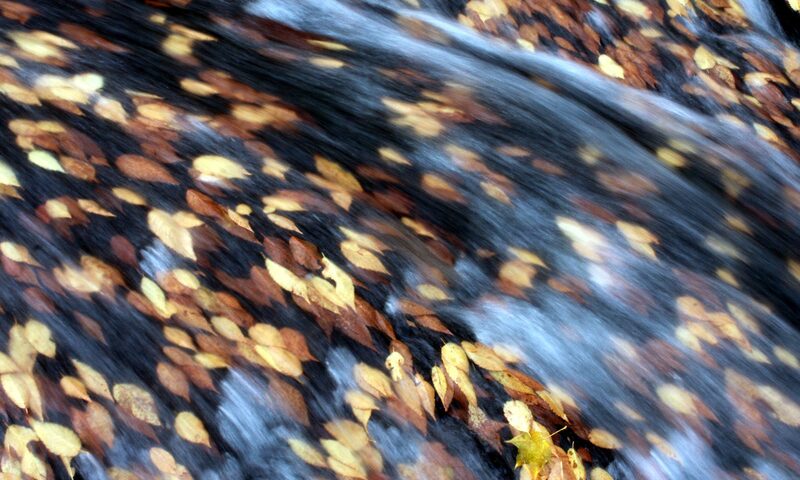 Fall is a time of dropping temperatures, falling light levels, and decreasing rain. It also is the time when Neofinetia initiate their flower stalks for next year, so you need to take care of them correctly. It is said that some growers change their fertilizer to one that favors phosphorous so as to get better blooming. That may indeed work well, but honestly I don’t bother. It is important to water plants adequately at this time so that the newly developed flowering shoots stay hydrated and healthy. They are visible in some cases as a very small growth that looks somewhat like a new growth, but is more elongate. Sometimes they remain hidden under the attachment point of the leaf until the next spring, but often you can see a slight bulge. Once true winter hits in late December I dry the plants off quite a bit, keeping them just barely moist. The trick is to keep them hydrated without rotting the roots in the colder conditions. In warmer conditions, say above 15 C (60 C) if you water too much they will break dormancy. Another problem during this time is keeping those new flower stalks alive through the winter. If kept too dry they will die, so don’t desiccate the plants and keep the humidity above 50%, with 70% – 80% being preferable. At this time it is OK to give the plants more light as well since in their native homes they often grow on deciduous trees and are subject to more sunshine, albeit weak winter sunshine. Also, no fertilizer at this time at all. Wait ’til spring when you see roots starting to grow, then you can begin feeding again. All in all, I find fuukiran easy to grow and flower, in fact they may be the easiest Japanese orchid species to keep. If you use the above information as a guideline, I can almost guarantee you will succeed with these little beauties too. Well grown, well presented. Such an exacting grower and conniseur with the ability to articulate the subtle nuiances of such success is not so easily encountered, and all blended into one individual none the less. This should become a blog for discerning and advanced plantsmen in short order, and a resource extraordinaire. I agree with Darcy, Bravo on the quality and style! Wow, I have been toying with orchids for 30 years and I always have overlooked Neofinetia falcata. Now that I have read your information and this orchid’s interesting history. I would love to try my hand at such a simple and attractive orchid. The simplicity, history, and varieties that have been bred makes for a very interesting group of small orchids. Their presentation is so attractive! I think I will start with a fuuran first. Thanks! Yes, all should be reasonably similar in terms of overall cold hardiness. Perhaps ones derived from Amami Island stock may be a bit less – case in point, an Amami plant I’ve grown in a crape myrtle showed significant cold damage in the winter of 2010/11 while other forms growing right alongside were unaffected. Be careful with the orange to yellowed flowered forms though since they have quite a bit of “tropical blood” from Ascocentrum and no doubt are less hardy. Happy growing. I have what I think are Amami type that I’m growing outside in a frost protected area that gets night temps down to about 27-28 at the most and only for a few sparatic days in the winter. So far so good! I think this spring I will move some of my other types outside and see how they fair. It is very hot ( mid 90’s – over 100 degrees ) and dry here in the summer with humidity levels dropping down to 26 % on some days. So the summer may be more of any issue than the winter but I want to experiment and see. I originally got here looking for affordable furan pots (sorry for the clueless question). Have since been reading the very well written articles to learn more about this very beautiful art of growing orchids on this site. I particularly liked the videos showing the variety of flowers, leaf types, etc. It was a pleasure to watch the expertly edited videos. Thank you Jean. 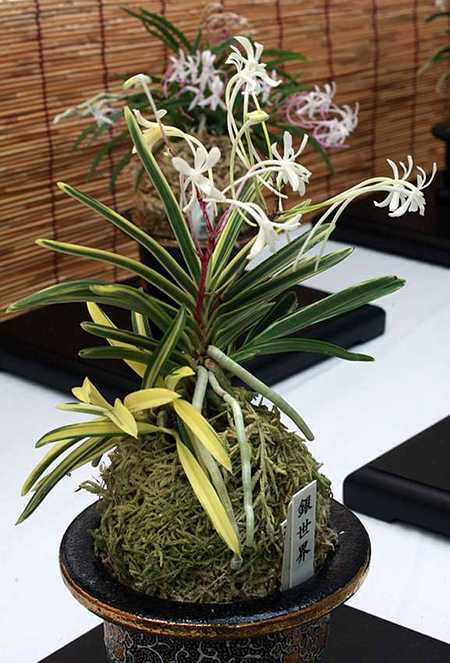 Japanese made Neofinetia pots are not cheap to be sure. I’m at least glad you liked the videos and articles. I’ve been meaning to add more, but as you know, time is in limited quantity! I really love those plants , the things is : they are very difficult to buy in France , do you have an idea ? I have just been thrown from a ebay bid , they dont want to sell to Europe !! Sorry, I don’t know any vendors in Europe. Hi. I’m growing my neos inside, and I keep them on the second floor of my town house. The temps are pretty steady in the mid to high 60s. They are potted in the traditional form, and they dry out after about two days. I’m using a spray bottle to keep them watered, and the room they are kept in is anywhere from 40 to 60 % humidity. Does that seem to be okay for winter care? I’m afraid to keep them anywhere too cold because I kept some in colder conditions outside and they froze. They’re not cheap plants so I don’t want a repitition of that. Any advice or opinions are appreciated. I think you should be OK with that winter set up. They don’t necessarily need very cold temperatures in winter since they are successfully grown in tropical countries such as Thailand. They can take down to 28F or even a bit lower without trouble, but beyond that and you’ll start to see damage. If you cool them down and “dry” them off a bit in winter that should be enough. In growth they like lots of moisture and heat. Some folks grow them near window panes to simulate winter conditions which is fine too. Great article and video too. Always enjoy your videos and articles. Thank you. You mentioned neo grows successfully in Thailand. I wonder which part of Thailand? Do you know any neo nursery in Asia selling neo flasks for purchase ? Thanks again. Thanks John. The ones I heard about were in Bangkok, so a tropical climate. I don’t have any details about them though. I do see flasks for sale here sometimes, but they are as a rule small with just a handful of plants in each (obviously replated). You may want to contact Seed Engei about this: http://www.seed-engei.com My understanding is the production via flask on a mass scale is happening in Korea for the most part. Hi, thoroughly enjoyed your article and videos. We have Kristen Uthus talking to our orchid society about Japanese orchids and like to have an article in our newsletter that complements our speaker’s presentation. I was hoping to reprint your fine article in the newsletter with links to your videos. Keep writing, your articles and videos are excellent! Osaka! So you are in Japan. I’m in Fukuoka. Nice to hear from you. Fukiran growing in/on akadama is quite odd. I would recommend you pot them in something different before they really begin to grow most of their roots for the year. I’m sure they’ve started already. You can grow them in pure sphagnum moss, which is the tradition in Japan. The pot should be absolutely free draining. If you cannot find a Neofinetia pot or your plants are too large for one, then I would either mount them on treefern fiber with a bit of sphagnum as a base, or I’d get an unglazed clay pot that is just big enough to accommodate them. Taller is better. Again, use sphagnum as a growing medium. You can get sphagnum at Nafco, as well as treefern mounts. I use regular fishing line to tie orchids to mounts. To see more specific information about how I repot Neos using the traditional method, see this video I made a couple years back. Good Luck with your plants! Thanks a lot Tom. I guess I’ll just look and drool while I’m there and hope that the more rare forms will be available state side at some point. PS, I love your new video on the Fukuoka show. Just wish the neo section was more extended. That is a crazy bike route that you take though. Looks a bit dangerous at times. Yup, it’s pretty nutty riding, but luckily Japanese motorists are far more careful than many around the world. Believe it or not, that was a pretty thorough run through of what was at the show. Glad you enjoyed it. It won’t be my last fuukiran video, that’s for sure! Hi Tom. Would you think I could grow Neofinetia flacata in a frost free frame along with my pleiones and Dendrobium moniliforme. The latter does very well so I am thinking Neofinetia flacata would probably work. The frame humidity can be kept very high with a sonic humidifier. Many thanks. Love your videos. Simon. Well, if the Dendrobium does well, then I don’t see why the Neofineta would be unhappy. In nature they live in the same regions, though the former does live a bit further north. The critical issue is that the plants get enough summer warmth, and also not too long a winter. That said, four months of temperatures between 0-10 C is OK, if followed by a warming trend with a growing season with temperatures in the 18-25 C range for a minimum of 5 months. I’d give it a try, but start with a common variety, not a fuukiran!